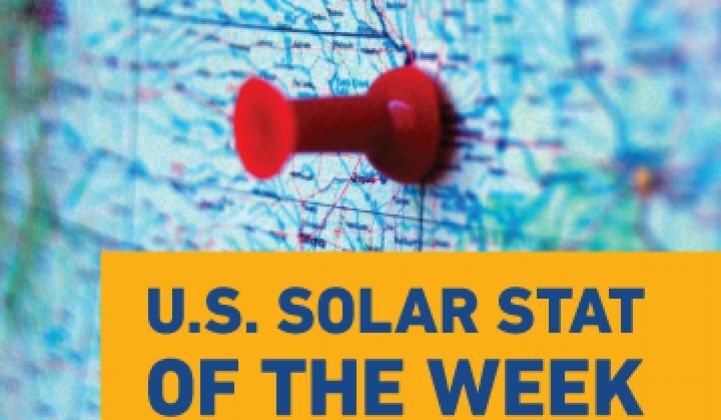 Solar Renewable Energy Credit (SREC) prices have reached new lows in the East Coast gold rush markets of New Jersey and Pennsylvania. In New Jersey, spot prices have dropped to $166.79, a far cry from the consistent $600-and-above pricing seen in 2010 and the first half of 2011. 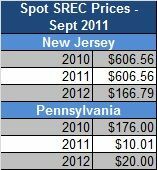 In Pennsylvania, SRECs have been trading at just $10, down from the high-$300 prices seen early last year. 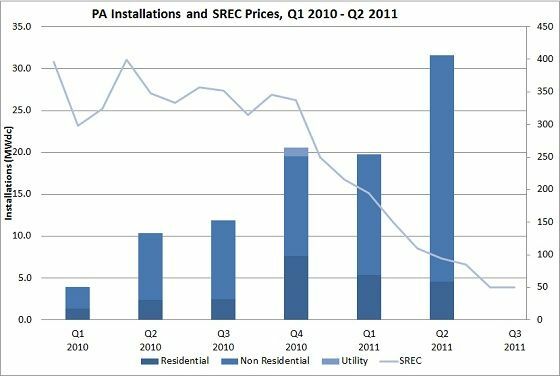 Pennsylvania's SREC prices have fallen steeply since the end of 2010, yet despite this, installations have increased 60 percent quarter-over-quarter. This additional capacity coming online is the due to the backlog of projects that developers and integrators have accrued since the start of 2010 finally being built out. This extremely low price for SRECs could signal that the Pennsylvania market is finally cooling off and installations will taper in the fourth quarter of 2011 through 2012. 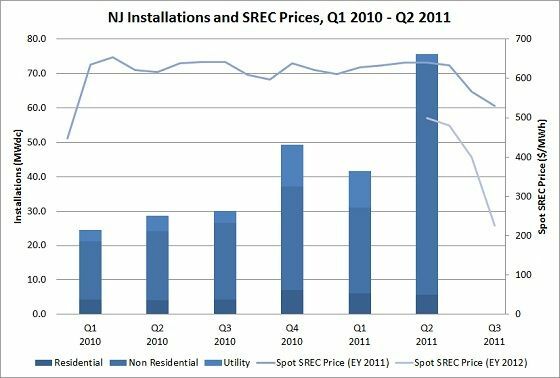 On the other hand, New Jersey's SREC prices remained high through the end of the second quarter, but with the onset of Energy Year 2012 (June 1, 2011 through May 31, 2012), they have plummeted to less than $200. 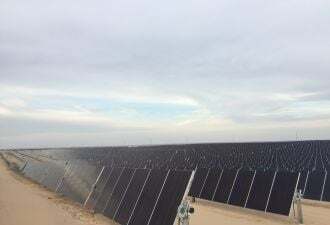 This price drop is a result of New Jersey surpassing its Energy Year 2012 solar goal of 370 megawatts shortly before the end of the third quarter of 2011. Like Pennsylvania, New Jersey's massive growth in Q2 came as a result of developers completing an existing pipeline of projects. It's likely that this backlog will keep installers and integrators busy through the end of 2011. Moreover, the expiration of the 1603 Treasury Program will force system owners to assume SREC risk in order to begin construction before the end of the year. This additional capacity will drive New Jersey SREC prices even lower.